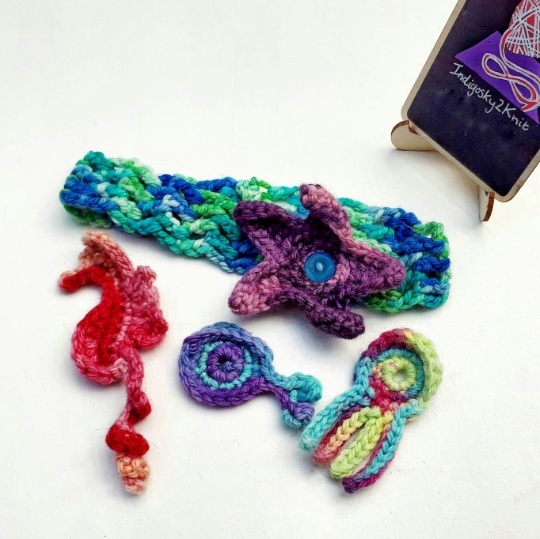 These interchangeable headband set are a great for all girls, young and old alike. These interchangeable headband set are made to order. The photographs show some examples of pervious makes. Your set will be made from yarn that I have available from larger projects. This will by standard either be wool or cotton based fibres. Sizes available from 6 months upto adult size. If you’d like another fibre using like bamboo or alpaca (other fibres may be available too) then please drop me a message through the Etsy conversation function with your request. At Indigosky2Knit I have a preference for natural fibres for a variety of reasons as outlined in my About section so 100% acrylic will only be an option at special request or if you send me your own yarn. Please tell me what colour/s you would like for your headband and any of the extras.